The Lesbian Information, Library and Archives Centre in Wellington is for women-oriented women. It has the largest accessible collection of lesbian books and other materials in the country. LILAC opened ion September 17th 1994 and has been open almost continuously since then ... apart from a period when we lacked premises. LILAC is a women-only space, although small children with their mums are okay. LILAC is an entirely voluntary organisation. Any lesbian member is welcome to join the collective which keeps LILAC running. We welcome support with fund-raising - to pay running costs (our rent has gone up in our new premises), so that subscriptions can be used to keep the collections growing. Oh ... and the name - we came up with the name LILAC way back in 1993 when we started planning the library. Then someone filled in the words for the acronym. 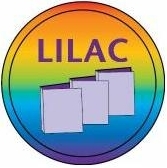 Mostly LILAC is a library, though we do have a noticeboard and fliers for lesbian events, groups, etc. There is an interview with collective members about LILAC on PrideNZ.com. The In Memoriam remembers two stalwarts of LILAC and the lesbian community - Porleen Simmonds and Pat Rosier.